When you, as a facility manager or building owner, decide to reduce the energy consumption and environmental impact of your building by integrating photovoltaic energy production there is an important decision to be made: what to do with this photovoltaic energy. Numerous financial mechanisms are available, such as feed-in-tariff (the rate you are paid for electricity exported to the grid), net metering, and net billing, to name just a few. But your basic decision is between exporting power to the grid and self-consuming that power. Your choice will naturally depend on the economic benefit, which in turn may depend on the current policy mechanisms being supported, country- or region-based incentives, and electricity rates. Return on investment and ease of implementation are prime considerations in choosing which way to go. This post reviews the trends on both grid export and self-consumption for photovoltaic energy to enlighten your thinking and facilitate your choice. It also explains the consequences of this choice for your building, regarding both electrical installation and energy management. 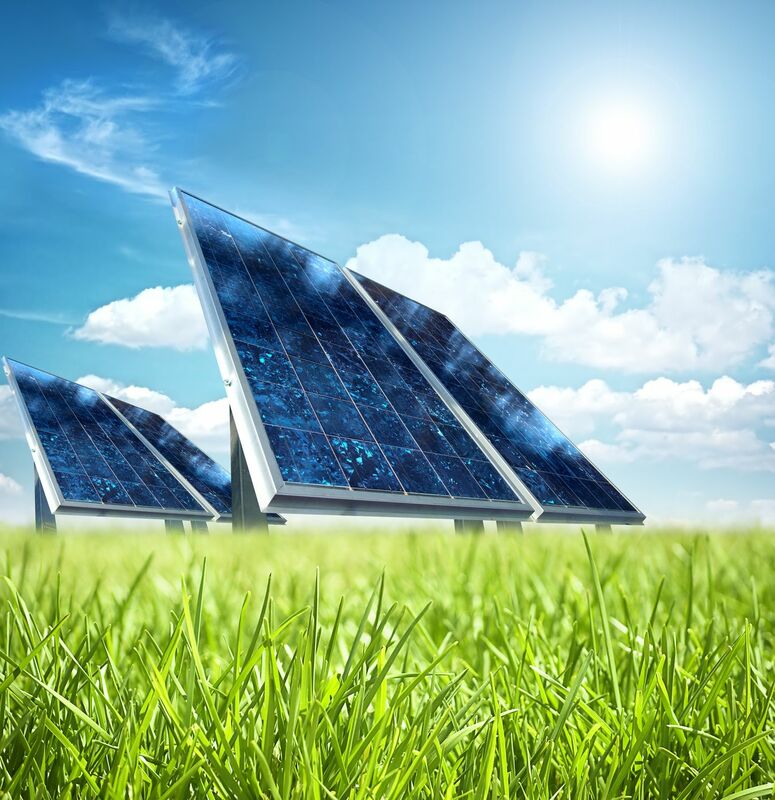 Widely used in the past, most often under the feed-in-tariff policy mechanism, this option offers a long-term contract with guaranteed rates for exported PV energy. This model was popular in the past because it was supported by a massive subsidized campaign to expand solar energy deployment. 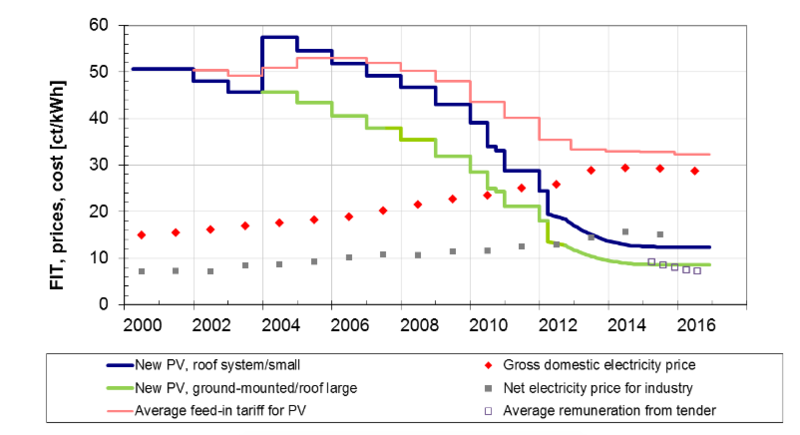 With the decrease of PV system costs and the increase of PV installed capacity, the feed-in-tariff rates have progressively decreased in many countries, becoming even lower than end-user electricity rates. When that is the case, self-consumption becomes more profitable, and thus progressively replaces exporting to the grid. The trends in electricity rate evolution in Germany are shown in Figure 1. In 2006 an industrial customer in Germany was paid roughly 40 cents per kWh for selling its PV energy production, buying its electricity at the much lower tariff of around 10 cents per kWh. Exporting the PV production was financially advantageous and this option was preferred. Ten years later, in 2016, the tariff of selling the PV energy is lower than the electricity rate, so self-consumption is more profitable. Figure 1. Evolution of feed-in-tariff rates and electricity price in Germany. Source: Recent Facts about Photovoltaics in Germany, Fraunhofer ISE, 2017, page 10. Self-consumption is the economic model where the residential, commercial or industrial entity uses the generated PV electricity to cover its own electricity needs, thus acting as both producer and consumer, or prosumer. The solar energy being produced is consumed instantaneously. If and when the generated PV electricity exceeds the prosumer consumption, several options exist to valorize the PV production excess: it can be injected into the grid; it can be stored and used in deferred time; or prosumer consumption can be shifted to fit the PV production, which will be the subject of a subsequent post. Self-consumption is the model promoted and supported today by a growing number of countries because it makes citizens active players in the energy transition and contributes to meeting the objective of increasing the share of renewables in the energy mix. It promises greater future independence from the grid and electricity rate variations. There’s a simple reason that each PV energy prosumer’s choice between exporting to the grid and self-consuming is so important: It determines how and where the PV installation connects to the building’s electrical distribution system. To learn more, please read our white paper “How Prosumers Leverage 4 Technologies for Greener, Reliable, Economical Energy.” I’ll discuss how this works in more detail in the next post in this series. Great article has been very useful to me. Thank you very much. Yes, this post is very instructive and nice to read. Is self consumption of photovoltaic renewable energy really this simple? Why You Should Design Your Renewable Energy System for Self-Consumption (Vive la Difference!) Power Up Your Building With These Renewable Energy Technologies Photovoltaic equipment: What are the hazards and how can you prevent them?